This is a vintage maker marked and gold filled marked ring with a beautiful cultured pearl and a pretty Florentined finish in the center. It is marked gold filled with the maker’s mark. Ring size is 8. 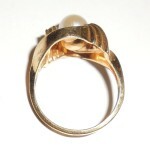 The pearl is gorgeous cream white, light rose’ tint and unblemished; a nice older pearl. 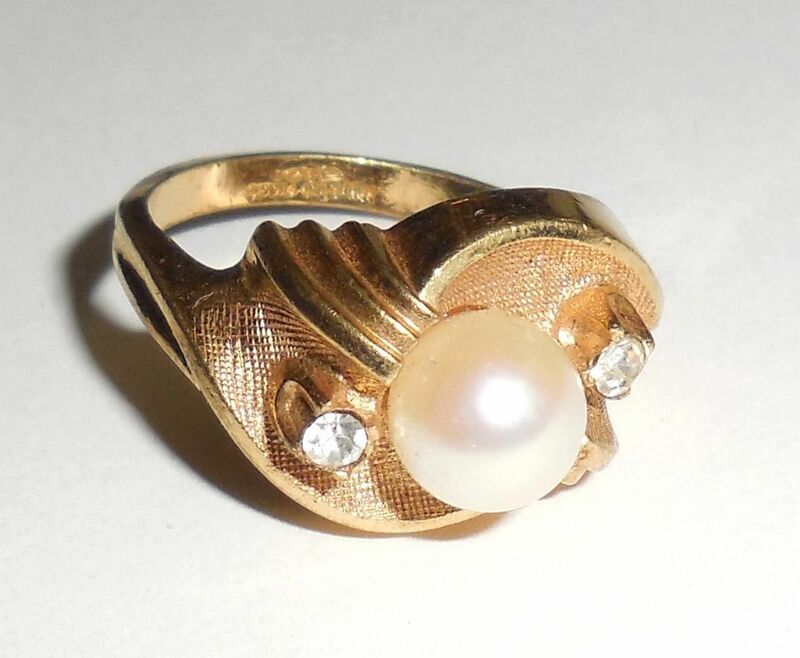 A lovely vintage estate ring for your collection. 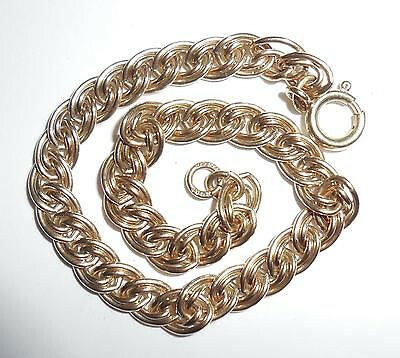 This is a lovely vintage gold filled double link bracelet in beautiful, no gold wear condition. It is marked 1/20 12K GF, Elio. Size is 7 5/8" long by 1/4" wide. Weight is 10.3 grams. Very well made and in excellent condition this is a lovely bracelet for charms or to wear alone or layered with other bracelets. 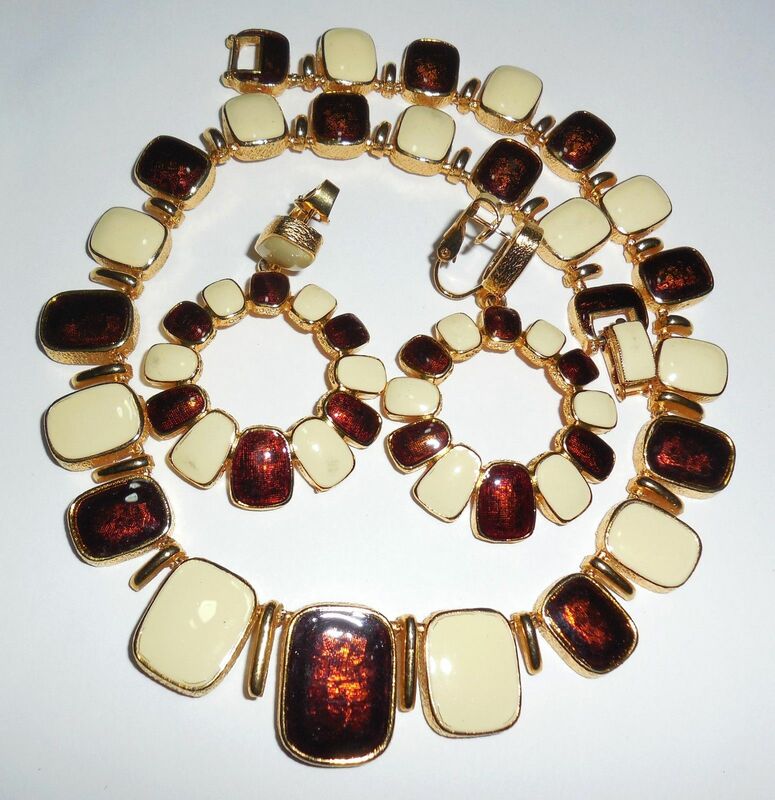 Gorgeous vintage heavy gold plated late mid century enamel collar necklace and earrings set signed DG with a copyright marking. 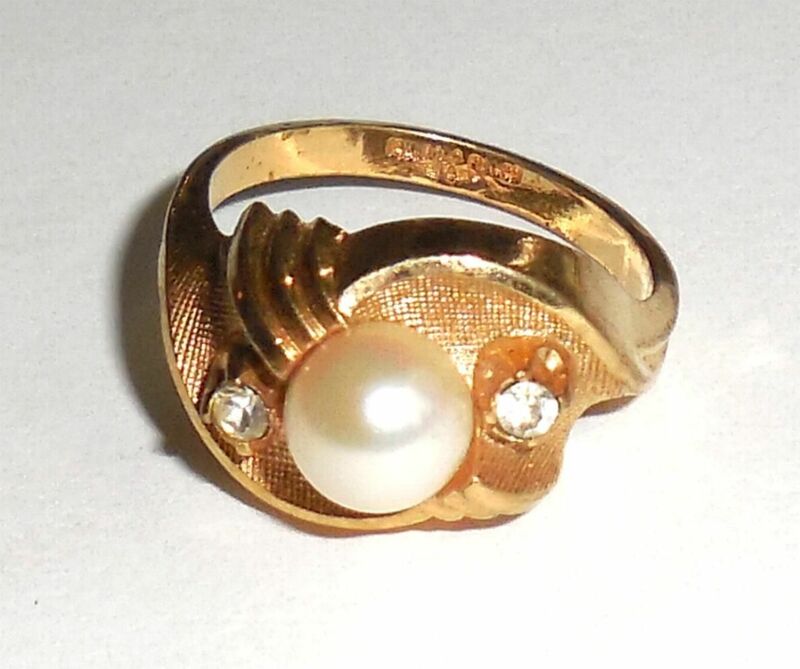 Beautiful Excellent, No Gold Wear, No Enamel Wear Condition. From an estate and hardly ever rarely used. Completely original, never altered or repaired in any way. Very much like when it was originally made in the 1970s. Size of necklace is Small/Medium 14 1/4″ neck circumference by 13/16″ wide on the center element. 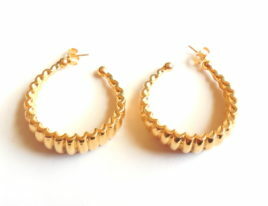 The earrings are Large pierced posts with omega backs. Well made. They measure 2 1/4″ North to South from the top of the white rectangle down to the bottom of the large brown rectangle. Width across the hoop East to West is 1 7/16″. 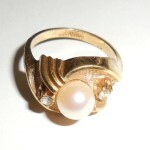 This is a big beautiful late mid century set for your vintage jewelry collection. The enameling is showy with gold highlights amid the chocolate color. Vintage Egyptian Revival Silver Chain Wrap Screw Back Dangle Earrings L - Size Large. 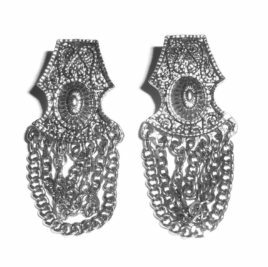 This is a gorgeous pair of old 1960s to 1970s mid century vintage hinged screwback earrings with very ornately detailed Egyptian Revival fronts with and a dangle wrapping of multiple silver chains. Old store stock from an old jewelry store in beautiful store display condition. They are very heavily silverplated and have a dark antique finish in the grooves. Size of each earring is 2.25 inches tall north to south. Condition is like new. No wear marks at all. No wear to silver. Better than photos this is a beautiful, pair of very showy, older vintage Egyptian Revival earrings in wonderful condition for your collection!! The screwbacks are strong and work well. Very well made. 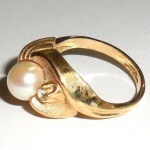 About 1950s and 1960s jewelry: The manufacturing of jewelry depends on prosperity. When people are able to afford jewelry, it is fashionable to buy and wear it. The United States emerged from World War II as a superpower. The 1950’s and 1960’s were decades of economic growth. Working class Americans had money to spend on jewelry. 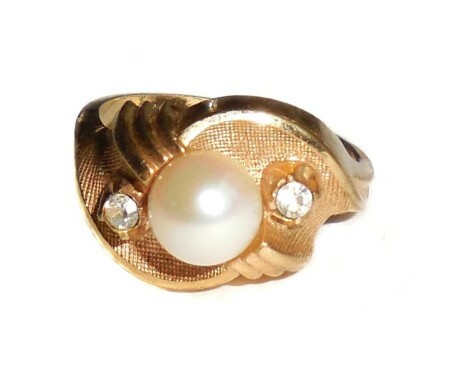 Public education, the mass media, and television informed the nation enough about past events to develop keen interests in all styles of jewelry. People chose to wear diverse styles of jewelry. They developed discriminating tastes, which the jewelry industry sought to satisfy. These factors gave the jewelry industry a boost and allowed jewelry retailers to make a profit. 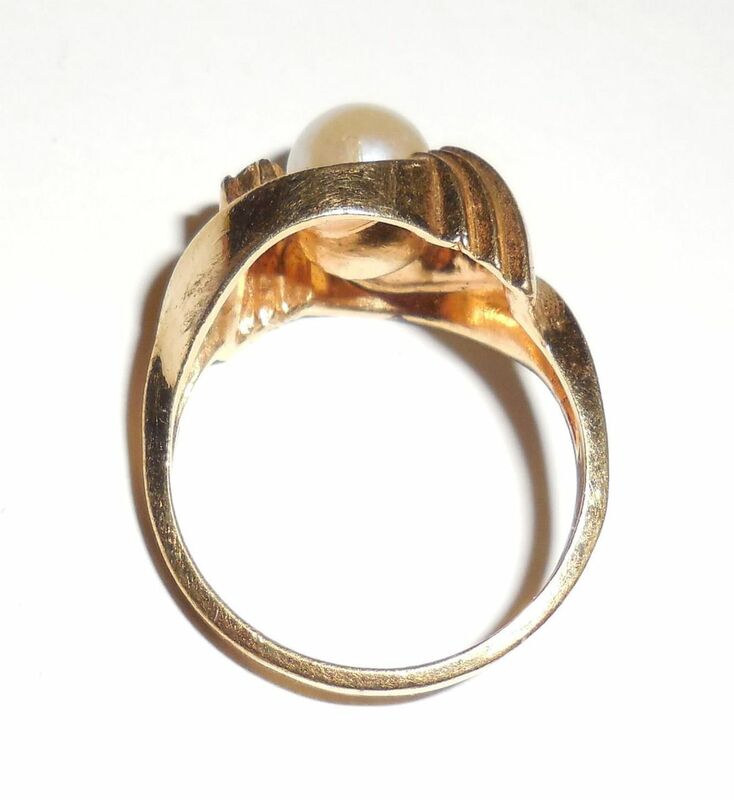 Many people began collecting jewelry in the 1950’s and 1960’s. Some wonderful jewelry collections trace their origins to this time. 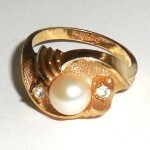 See Ruby Lane Blog https://www.rubylane.com/blog/categories/jewelry/jewelry-of-the-1950s-and-1960s/ for more info on vintage 1950s and 1960s costume jewelry. 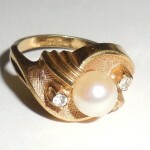 It shows you examples by picture and how well made the jewelry of this era was. Large, elaborately made and very visible and showy were characteristics of all jewelry during this post World War 2 time frame. Large Vintage Industrialist Pierced Hoop Earrings Yellow Gold Plate - Mid Century Modernist - This is pair of vintage 1970s to 1980s, pierced post, hoop earrings with mid century modernist industrialist machinist design. 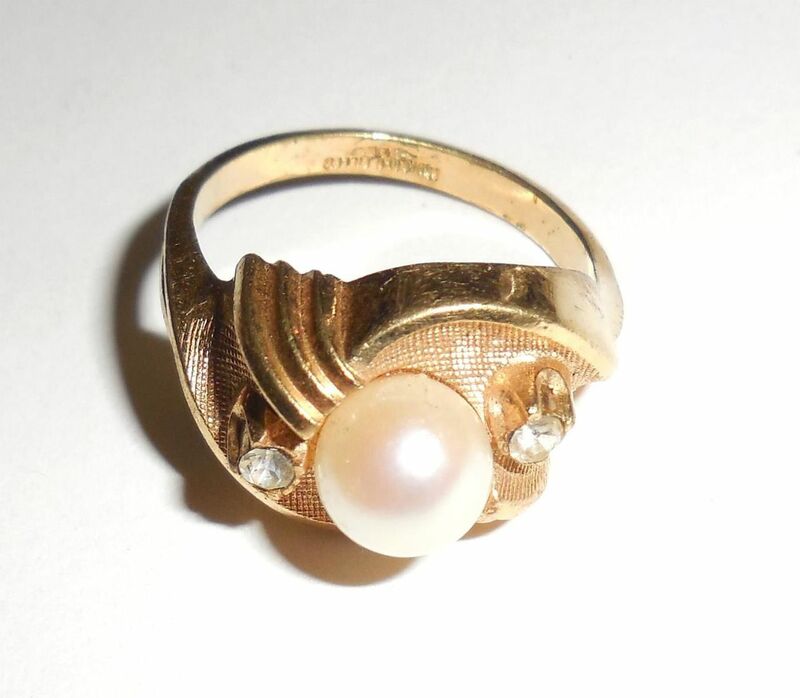 They are very heavily gold plated and are likely vintage Goldette jewelry. 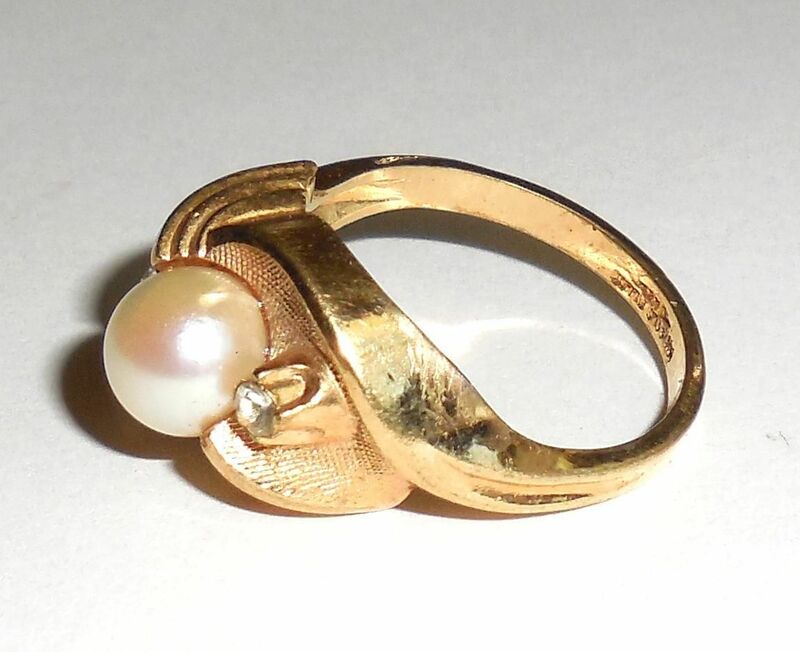 As many Goldette collectors know, the gold plating on Goldette jewelry was so heavily applied that oftentimes the marking is either very faint or not found because it lies underneath the gold. These earrings were part of an estate of an old jeweler who manufactured and distributed jewelry for Goldette, Florenza, Hollycraft and many other costume houses during the 1970s to 1990s. They were only ever used for display and are in original, excellent condition having only a NY mark inside each earrings. All gold is intact and there are no scratches, dents, dings etc....No damage. No repair. They are also very heavy and showy! Size across each earring hoop is just over 1". Height north to south is 1.25". The outside of the earrings are graduated from 1/16" at the very end tips to 7/16" wide across the bottoms. Weight is 19.6 grams for both. This is a lovely, showy pair of earrings for your vintage jewelry collection. Hard to find these in this condition and weight.